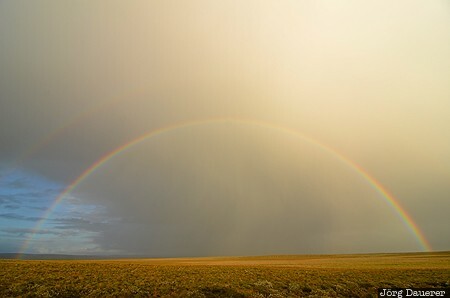 A full rainbow over the flat brown meadows near Apavatn lake in front of colorful sunset clouds. Apavatn is in Suðurland in the highlands of Iceland. This photo was taken in the evening of a cloudy day in September of 2013. This photo is part of the exhibition Rainbow (February 2017). This photo was taken with a digital camera.